Can using a well move a mountain? It will if the well is big enough. Winter rains and summer groundwater pumping in California's Central Valley make the Sierra Nevada and Coast Mountain Ranges sink and rise. How much? A few millimeters each year. That doesn't sound like a lot but it creaes stress on the state's faults that could increase the risk of an earthquake. Gradual depletion of the Central Valley aquifer due to groundwater pumping also raises these mountain ranges by a similar amount - about the thickness of a dime - each year, according to a new paper in Nature. That cumulative rise over the past 150 years could be up to 6 inches, according to calculations by the geophysicists. There is no evidence that seasonal changes in the Central Valley aquifer are associated with any earthquakes but studies have shown that similar levels of periodic stress, such as that caused by the motions of the moon and sun, increase the number of microquakes on the San Andreas Fault. If these subtle seasonal load changes are capable of influencing the occurrence of microquakes, it's possible that they can sometimes also trigger a larger event, said Roland Bürgmann, a geoscientist at the University of California, Berkeley and co-author of the Nature paper. "The stress is very small, much less than you need to build up stress on a fault leading to an earthquake, but in some circumstances such small stress changes can be the straw that breaks the camel's back," Bürgmann said. "It could just give that extra push to get a fault to fail." The study, based on GPS measurements from California and Nevada between 2007 and 2010, was led by scientists Colin Amos at Western Washington University and Pascal Audet of the University of Ottawa. The detailed GPS analyses were performed by William Hammond and Geoffrey Blewitt of the University of Nevada, Reno, as part of a National Science Foundation (NSF) grant. Hammond and Blewitt, along with Amos and Audet, are also co-authors of this week's paper. "Other studies have shown that the San Andreas Fault is sensitive to small-scale changes in stress," said Amos. "These appear to control the timing of small earthquakes on portions of the fault, leading to more small earthquakes during drier periods of the year. Previously, such changes were thought to be driven by rainfall and other hydrologic causes." This work ties overuse of groundwater by humans in the San Joaquin Valley to increases in the height of nearby mountain ranges and possible increases in the number of earthquakes on the San Andreas Fault, said Maggie Benoit, program director in NSF's Division of Earth Sciences, which funded the research. "When humans deplete groundwater," said Benoit, "the amount of mass or material in Earth's crust is reduced. That disrupts Earth's force balances, causing uplift of nearby mountains and reducing a force that helps keep the San Andreas fault from slipping." Water has been pumped from California's Central Valley for more than 150 years, changing what used to be a marsh and extensive lake, Tulare Lake, into fertile agricultural fields. In that time, about 160 cubic kilometers (40 cubic miles) of water was removed--the capacity of Lake Tahoe--dropping the water table in some areas more than 120 meters (400 feet) and the ground surface 5 meters (16 feet) or more. The weight of water removed allowed the underlying crust or lithosphere to rise by so-called isostatic rebound, which may have raised the Sierra as much as half a foot since about 1860. The same rebound happens as a result of the state's seasonal rains. Torrential winter storms drop water and snow across the state, which eventually flow into Central Valley streams, reservoirs and underground aquifers, pushing down the crust and lowering the Sierra 1-3 millimeters. In the summer, water flow into the Pacific Ocean, evaporation and ground water pumping for irrigation, which has accelerated because of drought, allows the crust and surrounding mountains to rise again. "The hazard is ever so slightly higher in the summer than in the wintertime," he said. "This suggests that climate and tectonics interact, and that water changes ultimately affect the deeper Earth." Millimeter-precision measurements of elevation have been possible only in the last few years. 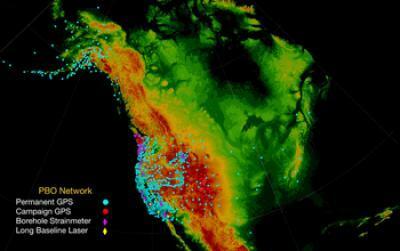 Improved continuous GPS networks--part of the NSF EarthScope Plate Boundary Observatory, which operates 1,100 stations around the western United States--and satellite-based interferometric synthetic aperture radar have provided the data. The measurements revealed a steady yearly rise of the Sierra of 1-2 millimeters per year, which was initially ascribed to tectonic activity deep underground, even though the rate was unusually high. The new study provides an alternative and more reasonable explanation for the rise of the Sierra in historic times. "The Coast Range is doing the same thing as the Sierra Nevada, which is part of the evidence that this can't be explained by tectonics," Bürgmann said. "Both ranges have uplifted over the last few years and both exhibit the same seasonal up and down movement in phase. This tells us that something has to be driving the system at a seasonal and long-term sense, and that has to be groundwater recharging and depletion." In response to the current drought, about 30 cubic kilometers (7.5 cubic miles) of water has been removed from Central Valley aquifers between 2003 and 2010, causing a rise of about 10 millimeters (2/5 inch) in the Sierra over that time.